Turkish readers have been dismayed by images published in local media showing the unique Lake Meke in central Turkey, a habitat of international importance for wildfowl, has almost entirely dried up. 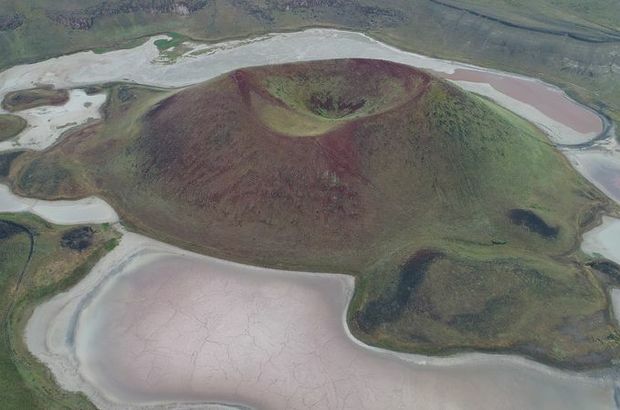 Thanks to the shape of the salt lake, which curls in a crater around a 4-million-year-old extinct volcano, Lake Meke was once likened to the Nazar, or “evil eye,” a talismanic symbol meant to ward off malevolent forces that is a symbol of Turkey. Yet the warmer temperatures caused by climate change and “senseless” government policies have brought the lake to the point where it is in danger of completely drying out, said Güler Göçmez, a geologist at Konya University. “Lake Meke, one of the world’s rarely seen geological formations, is at the point of drying out – in fact, has dried out – as a result of senseless agricultural policies and exploitation of groundwater as well as years of global warming and drought,” said Göçmez. This has led the lake to its current state, which resembles a stinking, rubbish-filled swamp more than the evil eye talisman it had once been likened to, Göçmez said. Lake Meke is recognised as a natural monument of Turkey, has been a protected area since 1989, and in 2005 was added to the international list of Ramsar sites, which are chosen for their importance to international wildfowl. However, the flamingos, ruddy shelducks and woodcocks that had for years spent incubation periods at the lake have long gone. “It used to be a natural wonder and a wonder of the world that was home to migrating birds at certain times of year. But the groundwater levels keep falling, and as a result the surface water, too, is drying up,” Göçmez said. The lake’s declining water levels had been on the agenda of environmentalists for years. One scientist found in 2009 that irrigation and excessive use of groundwater had already brought Lake Meke to the point of drying out, and bacteria turned the remaining water red after a drought in 2014. A social media user who visited the lake shared pictures last year showing the sorry state the lake had come to. Nevertheless, the lake’s reputation has made it a popular spot for visitors to have a picnic or drink alcohol. The number of visitors and the amount of litter they dumped has further deepened the problems plaguing the lake, and preventing further visitors is the most urgent measure that must be taken to preserve a hope of saving the lake, said Göçmez. Besides this, water with a similar chemical content should be brought from the nearby Lake Acıgöl to replenish Lake Meke, he said.